Konami today released the newest Pro Evolution Soccer 2015 Live Update, on schedule despite Christmas celebrations. As always, the new PES 2015 Live Update adjusts player ratings, squads and lineups according to latest league displays. 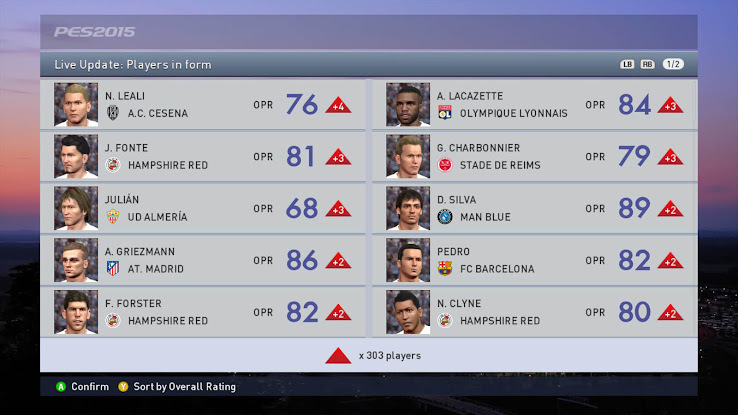 Covering the week of December 15 to 21, today's PES 2015 Live update boosts the stats of the likes of David Silva, Alexandre Lacazette, Pedro or Fraser Forster. In total, the stats of 303 players received boosts, while 23 players were downgraded. Antoine Griezmann was also upped by two points to 86 following his incredible performance in the 4-1 away win against Athletic Bilbao, where he scored his first hat-trick for Atlético Madrid. Along today's new Live Update, a new PES 2015 MyClub special agent offer was also announced: players can use a special MyClub agent which features the best players from 2014 and the most promising prospects for the new year, all rated 70+ overall. 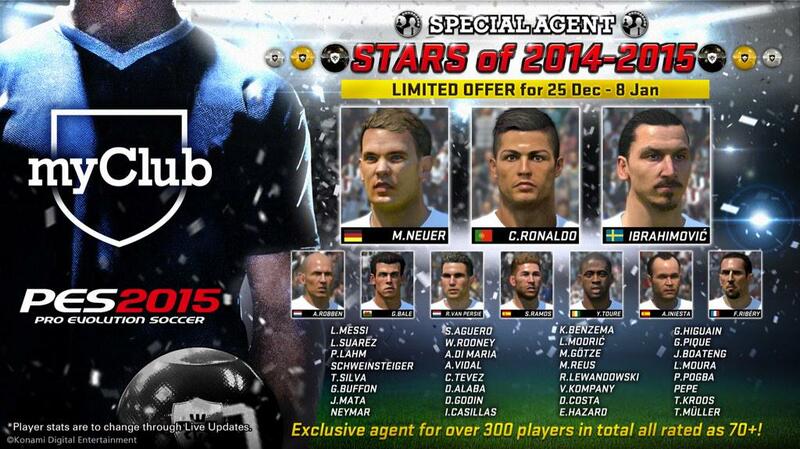 The new PES 2015 MyClub agent will be available until January 8 with more than 300 players available, including Cristiano Ronaldo, Lionel Messi and Manuel Neuer. The 25/12/14 PES 2015 Live Update also adds 55 players, most notable amongst them Eidur Gudjohnsen of Bolton Wanderers, Orlando Engelaar of Twente, Ainsley Maitland-Niles of Arsenal FC, Gianluca Gaudino of Bayern Munich and Paddy McCourt of Brighton & Hove Albion.